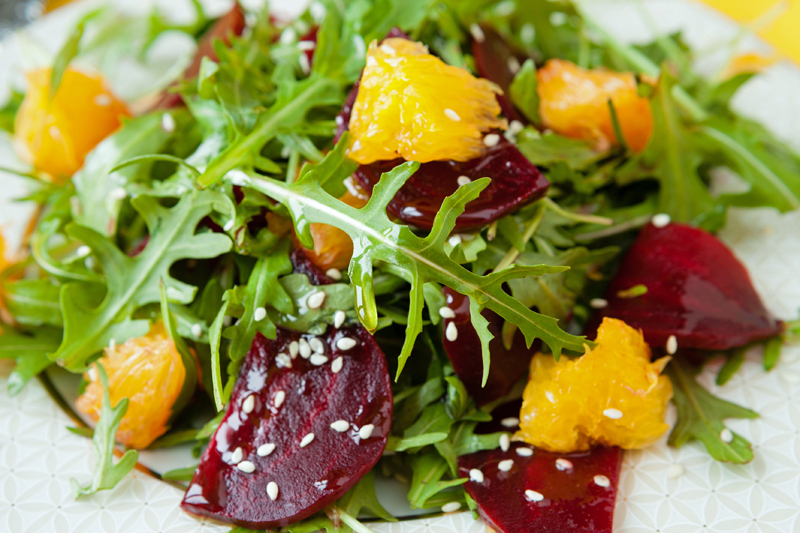 The flavor of this salad with its peppery arugula, sweet orange, and earthy roasted beets are all it needs; no dressing required. Sprinkle with the toasted sesame seeds for a delicious and flavorful salad that begs for nothing but a plate and a fork. Rinse the arugula, and place in a large bowl. Add the orange slices and beets, and toss gently. Meanwhile, in a dry skillet over medium heat, toast the sesame seeds while continuously stirring, 2 to 3 minutes or until lightly browned. Sprinkle sesame seeds over salad and serve immediately. Refrigerate any leftovers.